Pereira-Fradin (Maria), Jouffray (Céline).— Les enfants à haut potentiel et l’école : historique et questions actuelles, Bulletin de psychologie, Tome 59 (5), N°485, 2006, p. 431-437. Abstract : The relations between school and children with high potential are a very sensible matter, treated differently according to countries and times. After the presentation of some historical elements in order to understand the current situation in France and abroad, we will present the main models which the professionals of gifted children education refer to. If one excludes the theory of general intelligence on which are based the scales of Wechsler very much used in this sector of education, the two theories of intelligence most often quoted are those of Sternberg and Gardner. At the present time privileged developmental educational models being those of Renzulli and Gagné. Vrignaud (Pierre).— La scolarisation des enfants intellectuellement précoces en France : présentation des différentes mesures et de résultats de recherches, Bulletin de psychologie, Tome 59 (5), N°485, 2006, p. 439-449. Abstract : After having reported the debates relative to the intellectualy precocious children’s school attendance in France, we outline a panorama of the different existing pedagogical measures. The results of some researches turning on the intellectually precocious children’s difficulties of adaptation in the French school system are then presented. They turn on 1° the estimated frequency of intellectually precocious children having difficulties ; 2° on the intellectually precocious children’s behavior, from a set of conatovre variables ; 3° the effect of special pedagogical programs specially for the intellectually precocious children. The results don’t allow to validate the hypothesis of specific difficulties and show a limited effect of the pedagogical devices. Prudhomme (Nathalie), Blaquière (Geneviève).— L’enfant à haut potentiel : intégration scolaire et représentation, Bulletin de psychologie, Tome 59 (5), N°485, 2006, p. 451-461. Abstract : This paper turns on children with a hight potential’s integration in the school system. An experimental pedagogical device, designed for 12 gifted children, open at the 2004 re-opening of the Janson-de-Sailly college (Paris XVIe) and the questions it raises at the end of an academic year, are presented in a first part. This shows that most of the difficulties appear outside of the class-room and turn on the relations which establish themselves between the gifted children and their environment. This fact introduces a study of how « all-comer » children see the gifted ones. One hundred and eighteen college-pupils of first and second form answered to a questionnaire of some fifty items, turning on more than 40 aptitudes, dimensions or traits from the intellectual or socio-emotional fields. The first anlyses tend to validate the structure of the questionnaire and reveal the existence of complex, full of nuances and more or less stamped with contradictions according to the fields. Renzulli (Joseph).— Qu’est-ce que le haut potentiel et comment peut-on le développer chez l’enfant et l’adolescent ? 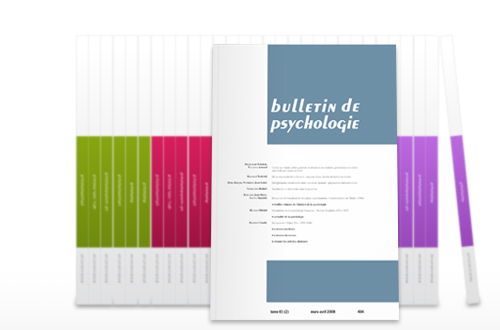 , Bulletin de psychologie, Tome 59 (5), N°485, 2006, p. 463-468. Abstract : The origin of high potential and specific educational needs of gifted pupils have formed the object of much debate, from several decades. Some chief questions, attacked in this field of study, are evoked in this text, from the point of view of a psychologist of education, who, within the scope of his three-rings model, has proposed definitions of high potential, so as special educative programs. Caroff (Xavier), Jouffray (Céline), Jilinskaya (Mariya), Fernandez (Gilles).— Identification multidimensionnelle du haut potentiel : mise au point d’une version française des échelles d’évaluation des caractéristiques de comportement des élèves surdoués, Bulletin de psychologie, Tome 59 (5), N°485, 2006, p. 469-480. Résumé : Après avoir rappelé les principes d’une méthode multidimensionnelle de l’identification, appuyée sur les conceptions récentes du haut potentiel et du talent, la recherche a pour objectif d’établir quel peut être l’apport de la version française du questionnaire SRBCSS-R (Renzulli, Smith, White, Callahan, Hartman et Westberg, 2002) à une telle démarche. La contribution empirique a permis de mettre à l’épreuve la structure factorielle du questionnaire, la consistance interne des dimensions évaluées et leur validité par rapport à différents critères d’intelligence, d’apprentissage et de créativité. Elle vérifie enfin que les réponses des enseignants concordent avec celles des parents et que le questionnaire permet de discriminer les caractéristiques des enfants à haut potentiel par rapport à celles d’enfants tout-venant. Abstract : After having recalled the principles of a multidimensional approach to identification, supported by recent theories of giftedness and talent, the research aims at establish what may be the contribution of the French adatation the SRBCSS-R questionnaire (Renzulli, Smith, White, Callahan, Hartman & Westberg, 2002) to such an approach. The empirical contribution allowed to test the factorial structure of the questionnaire, the internal consistency of the assessed variables and their validity as compared to various criteria of intelligence, learning and creativity. It finally confirm that the teachers’ answers agree with those of the parents and that the questionnaire allows to discriminate the characteristics of gifted children as compared to all comers. Weismann-Arcache (Catherine).— Hétérogénéité ou dysharmonie ? Clinique du fonctionnement mental des enfants à haut potentiel, Bulletin de psychologie, Tome 59 (5), N°485, 2006, p. 481-489. Abstract : The author approaches the problems of the high potential starting from a handing-over in question of the concepts of « dyssynchrony » and emotional immaturity. The point is to approach the mental processes underlying these behaviors. The methodology used, Rorschach and Piaget tests, call for various readings in reference to the development and the psychic organization of subjects aged from 3 to 12 years. The author concludes by defining some characteristics of the mental functionning of children with high potential’s mental. Besançon (Maud), Guignard (Jacques-Henri), Lubart (Todd).— Haut potentiel, créativité chez l’enfant et éducation, Bulletin de psychologie, Tome 59 (5), N°485, 2006, p. 491-504. Abstract : Creativity is increasingly considered to be important in educational programs for gifted children. We examine, first, differences in creative performance and their source in the interaction between cognitive, conative and environmental factors, highlighted by the multivariate approach. Second, several tasks that measure creative performance will be described. Third, the development of creativity in children will be studied. Finally, two research studies will be presented on the differences in creative performance between gifted and non gifted children and on the differences observed according to the teaching pedagogy. Pedagogical implications of the results are described. Moyano (Olivier).— Fausse allégation d’agression sexuelle à l’adolescence : à propos d’un cas clinique, Bulletin de psychologie, Tome 59 (5), N°485, 2006, p. 505-513. Abstract : The present paper explains singularly problematic of a case of false allegation of sexual abuse in adolescence. The author proposes an analysis from clinical interview obtained in judiciary environment, particularly from projective tests data (Rorschach and TAT). The analysis crosses the history of the teenager (author of the false allegation) with her personality. Psycho-dynamical approach gives us main teachings, discovering hysteria problematic at the origin of false denunciation and proposes paradoxical idea or a traumatic fantasy repairer, responsible for the transgression. de Tychey (Claude), Lighezzolo (Joëlle), Claudon (Philippe), Diwo (Rosine).— Réflexions sur la prévention de certaines formes contemporaines de dépression, Bulletin de psychologie, Tome 59 (5), N°485, 2006, p. 515-522. Abstract : The authors propose reflections about psychological prevention of depression in specific clinical : antenatal and postnatal intermissions ; infancy and adolescence (two psychological disorders are studied, respectively child hyperactivity and suicide). Prevention actions are proposed from many researchs’ results, showing that simple measures can be inserted into classical medical devices. Risk factors are studied. Albou (Paul).— Notes cursives sur la conférence IAREP ­ SABE, Bulletin de psychologie, Tome 59 (5), N°485, 2006, p. 523-527. Turbiaux (Marcel).— Colloque international « Orientation, passé, présent, avenir », Bulletin de psychologie, Tome 59 (5), N°485, 2006, p. 529-530.